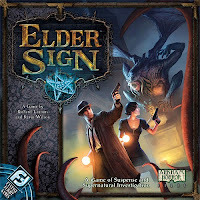 This episode I'd like to review Elder Sign, published by Fantasy Flight Games and designed by Richard Launius and Kevin Wilson. 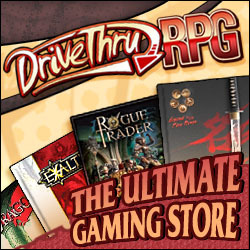 Fantasy Flight is one of the better game companies out there, straddling many markets in a similar way to Wizards and other large companies, they choose to diversify to survive. Fantasy Flight have published some of my favorites, including Battlestar Gallactica, Lord of the Rings (original and confrontation), and Drakon. Fantasy Flight is also famous (maybe even infamous?) for their coffin-box style games. These are boxes with hundreds of pieces that sometimes take a comparable number of hours to complete. Ten years ago I would have died to play these kinds of games, but the price of being an adult is limited time for the inner child. These days I like my games and role-playing fast and low prep, so it's nice to see that there are a lot of Fantasy Flight games out there now that fit well into that 30-60 minute range. Elder Sign is a spin-off of the cooperative board game Arkham Horror. I love Arkham Horror but, with a tear in my eye, I have to say I rarely play it. The game is just too long to play and takes at least 10 minutes to set up. Elder Sign is the express version and uses dice and cards in the place of elaborate board moves and a slew of pieces and mini-decks. There has been a longstanding trend toward "dice versions" of games. These are typically horrible. Elder Sign is not, its just faster. The game-play has definite similarities to Arkham Horror, you have an Old One -the big bad of the game- to beat, ever increasing tension in the form of the doom clock, and each player takes an investigator. An investigator has stamina, sanity, and items to get them through the adventure by the seat of the pants. The same role-play-light feeling of picking out characters is very charming, the same sort of feeling you might get from one of the big D&D 4e-esque boardgames. The basic goal of the game is to collect enough Elder Signs through completing mini-adventures on your turn, before a much briefer pile of doom tokens accumulate. Every 4 turns it strikes midnight and this pile gets a little bigger or life gets harder for the investigators. A mini adventure consists of rolling enough kinds of symbols to complete a quest, but the more rolls you need to make the harder it is to accomplish. Items, allies, or the help of other investigators can help you accomplish your goals. It all plays out like a frantic race to keep bad things off the table while not dying and at the same time needing to get Elder Signs in a time frame fast enough. Fail in this and you must face the Old One. Anyone who has played Call of Cthulhu can guess how well that goes. So besides time, why play this instead of Arkham Horror? Well for one the turns are a little more exciting, and there is a little less analysis paralysis as the options are slightly tighter. I find that the doom tokens pile up more quickly so things are a little more frantic, I find that sensation a little more horrific. Arkham Horror does the same thing, but the turns can drag often, even with veteran players. There is also an official app, Elder Sign Omens, for phones and tablets that is almost exactly the same game with a few minor tweaks to make it work for the platform. This dual release structure is the kind of thing that gives me hope that the tabletop industry can survive the digital age. If you don't want to front the cost for a board-game or have even less time than me, be sure to check this app out. Overall this is a tightly designed game, and while it didn't wow me as much as Arkham Horror did when I first played it, I think I found far more enjoyment in it and will play it more often. It has a fast play time and tension throughout play. Doesn't lose any of the genre charm or features that made Arkham Horror fun. Had an awesome mobile version released at the same time as the game, which actually plays just as well. Like its predecessor the game is hard, this can make it a little discouraging to new gamers if this is the first non-traditional board-game they play. I have a vague sense when playing, that my choices are a lot more limited than Arkham horror, which had a bit more strategy and a little less luck. The game seems well suited to 3-4 players as opposed to the 1-8 on the box; 1 seems boring and 8 seems very chaotic.